Distant lighting is widely assumed in computer vision. However, many scenes are illuminated by near light sources. An advantage of near lighting is that the intensity fall-off from the light source encodes scene depth. 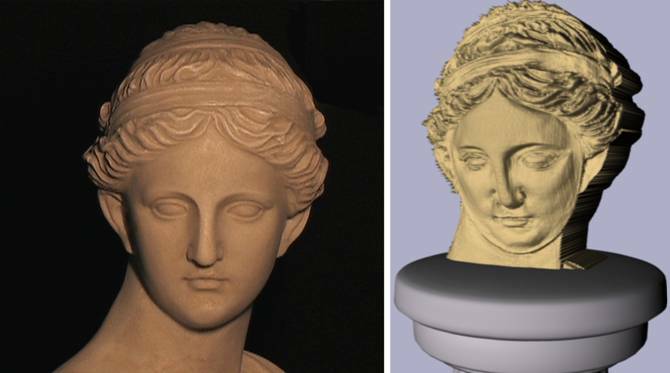 A drawback is that exact estimation of this depth requires the 3D position of the light source. 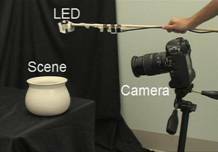 In this paper, we analyze what kinds of depth cues are possible under uncalibrated near point lighting. A stationary scene is illuminated by a point source that is moved approximately along a line or in a plane. We observe the brightness profile at each pixel and demonstrate how to obtain three novel cues: plane-scene intersections, depth ordering and mirror symmetries. These cues are defined with respect to the line/plane in which the light source moves, and not the camera viewpoint. Plane-Scene Intersections are detected by finding those scene points that are closest to the light source path at some time instance. Depth Ordering for scenes with homogeneous BRDF is obtained by sorting pixels according to their shortest distances from a plane containing the light source. Mirror Symmetry pairs for scenes with homogeneous BRDFs are detected by reflecting scene points across a plane in which the light source moves. We show analytic results for Lambertian objects and demonstrate empirical evidence for a variety of other BRDFs. 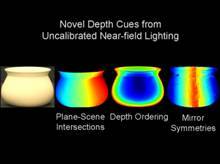 "Novel Depth Cues from Uncalibrated Near-field Lighting"
Our experiments were done by hand-waving a Lamina BL-4000 LED point light source in front of scene viewed by a Canon 1D Mark II camera. In all of our experiments we do not have the position of the light source and the camera is uncalibrated. Plane-Scene Intersections: Let a scene be illuminated by a point source moving along a line. We show that scene points intersected by a plane perpendicular to the light source will exhibit a brightness maxima. By simply detecting intensity maxima at every frame, we produce plane-scene intersections similar to those obtained by sweeping a sheet of light over the scene. Depth Ordering: A point light source moving in a plane illuminates a homogeneous scene under orthographic viewing. Under certain conditions, it is possible to obtain an ordering of the scene in terms of perpendicular distances to this ’base plane’. Changing the base plane in which the light source is being moved gives scene depth orderings with respect to different viewpoints. 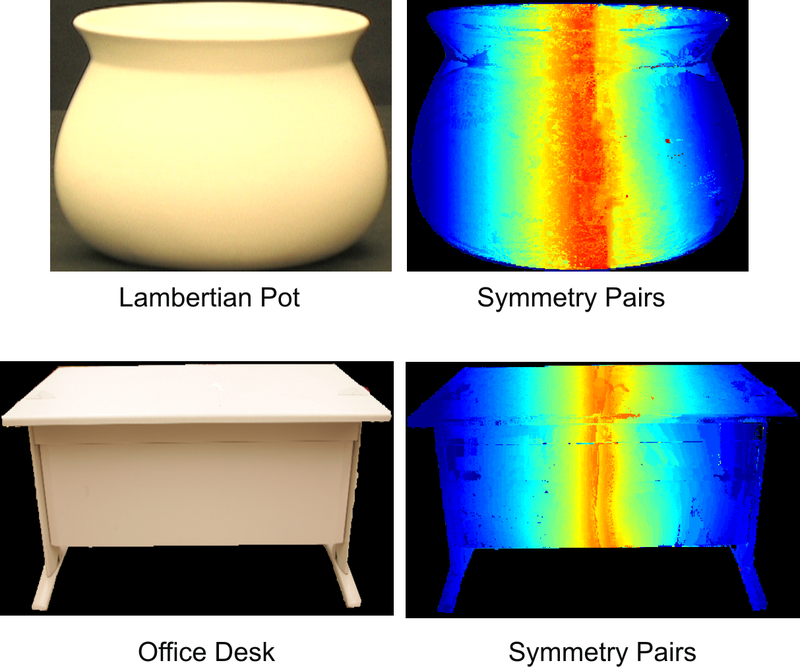 Mirror Symmetries: An orthographic camera views a scene illuminated by a light source moving along a line. We detect mirror symmetries by reflecting scene points across a plane containing the light source path. These symmetric pairs of scene points will observe identical incident angles and light source distances. Therefore, they can be detected by simply matching scene points with the same brightnesses over time. This video is a compilation of the main results of this project (50 MB). 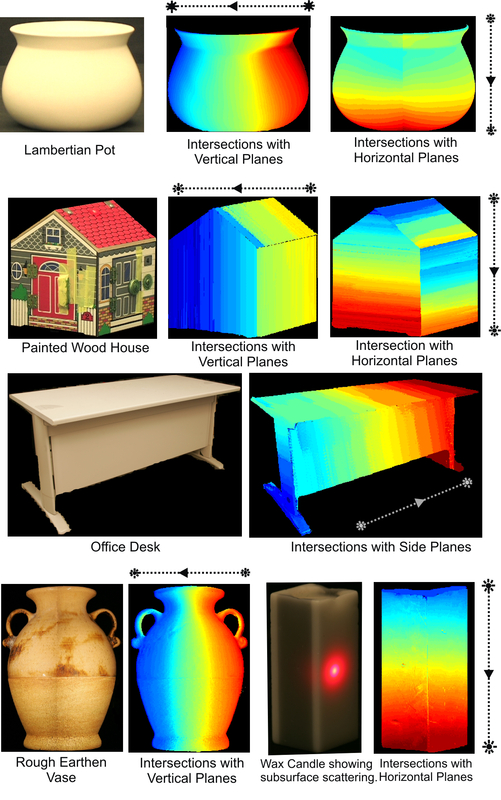 We show plane-scene intersections for different objects, as well as an example of how the results are very similar to those obtained from structured light. 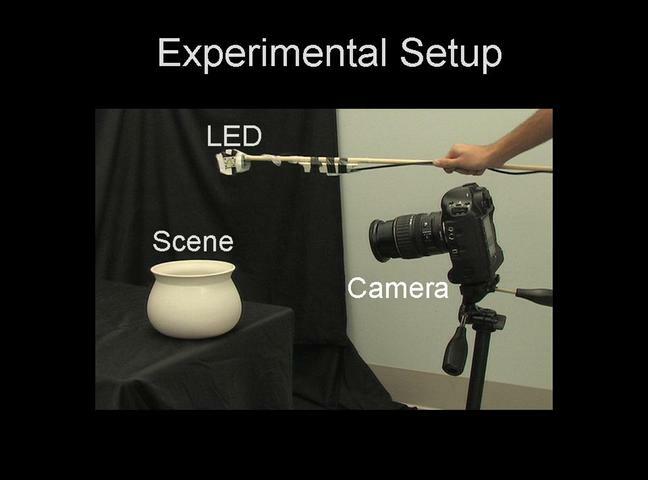 The depth ordering of a scene is used as a “pseudo depth” to visualize the object in 3D.